In this 6 deck game of European Blackjack, the dealer will draw on all hands up to 16, and stand on all 17s. Splitting is allowed, and one re-split is allowed per originally split card. You may double down on any two cards, even after a split or re-split. Split aces are treated like any other split card. Blackjack can only be obtained on the first two cards dealt in a hand. Any eight card player hand that has not gone bust will beat any standard dealer hand, with the exception of dealer blackjack. All wagers in European Blackjack are made using chips. Chips come in five different sizes – 1, 5, 25, 100, and 500. This lets you bet anywhere from the minimum starting bet (€/£1) to the maximum (€/£1000). When you win, the payouts are standard for online blackjack games: blackjack pays 3:2, insurance pays 2:1, a standard win pays 1:1, and all ties push. Like all of the great blackjack games coming from WagerWorks, European Blackjack is a combination of realism and bold computer graphics that together create a game that is pleasing to the eyes, but at the same time easy to see and use. The button bar along the bottom holds most controls, so the screen is left open for the cards and chips. Everything is subtly animated to create a sense of motion which definitely enhances the game experience. This game is almost as much fun to watch as it is to play! Take advantage of the Free Play option that this game offers. It doesn’t matter if you are an absolute beginner or a grand master, practice is essential. It’s also a good way to try out a risky new strategy, or just to help fulfill your urge to play when you are low on funds! European Blackjack from WagerWorks is blackjack at its best. 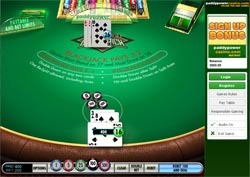 It features a very generous set of rules, which allows you to re-split, play on aces, and more. With such a loose game, as long as you can find yourself a good betting table or strategy, you’re bound to come out ahead, and as good as this game looks, you’ll probably have fun doing it too!